I’m in Decorah, Iowa this week, doing research at Vesterheim Norwegian-American Museum. Vesterheim features a spectacular collection of artifacts. I’ve blogged before about their alebowls, and about my experiences taking rosemaling classes. With so many tangible objects to grab attention, it would be easy to overlook a black-and-white exhibit panel. Yet this one captures my attention each time I visit. I began learning about and thinking about the immigrant experience while working at Old World Wisconsin. Later I considered the topic more broadly while scripting Cultural Horizons for public television. Questions of cultural identity have played a role in many of my books (including Trouble at Fort La Pointe, Betrayal at Cross Creek, The Runaway Friend, Highland Fling, and Old World Murder). The theme obviously resonates with me. Immigrant letters sent back to loved ones in Europe provide some insight into the experience of 18th- and 19th-century arrivals in their new homes. More rare—at least for me—are written records of how people felt as they prepared to say good-by. Paintings of tearful farewells convey well just how wrenching those departures from loved ones were. 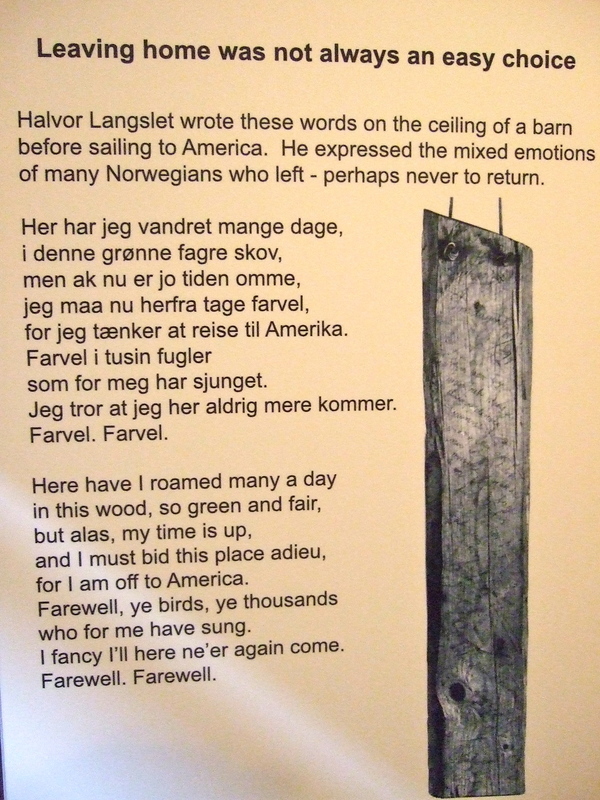 Halvor Langslet’s farewell, though, was about saying good-bye to a place. He evidently felt a need to actually write something down—and not on paper, but on a building. I imagine that felt a bit more permanent. I watched some kids experience the museum recently—kids who are well wired, able to Skype with distant cousins and use their phones to do almost anything. And that’s OK…but I’m glad that museums like Vesterheim continue to collect and share such rare reminders of what our ancestors experienced. The plot of Old World Murder (coming October, 2010!) revolves around an antique Norwegian ale bowl. I’ve always been intrigued by the beautifully carved and/or painted bowls. I recently went to Vesterheim Norwegian-American Museum in Decorah, Iowa, to take photos and learn more about them. On both counts, the trip was a success. More about that later, though, because something unexpected happened along the way. I was introduced to Norway’s rich folk-art traditions when I began working at Old World Wisconsin in 1982. I sought out more gorgeous woodenware and textiles at the State Historical Society of Wisconsin’s main museum, and at Little Norway (a special place near Mount Horeb, Wisconsin). Still, people told me I had to visit Vesterheim. An exhibit suggests what life was like in the old country. Vesterheim (which means “Western home” in Norwegian) is a world-class museum located in small-town America. Way back in the 1870s, Norwegian-Americans in Northeast Iowa began collecting and preserving objects that documented their ongoing story. The collection now holds over 24,000 artifacts. The first time I walked into the exhibit hall at Vesterheim, years ago, I was stunned by the collection’s depth. A curator at Old World at the time, I soaked up as much as I could. 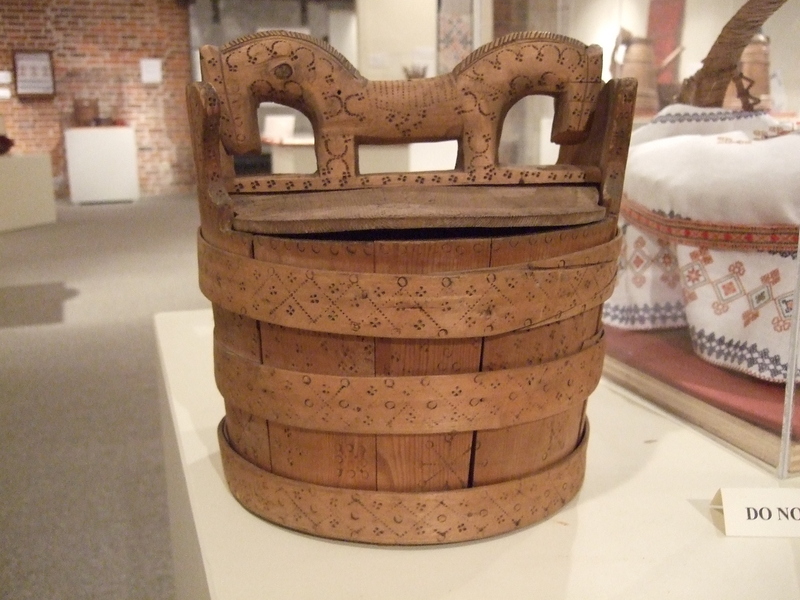 The material culture on display helped me understand more about the Norwegian families we interpreted at Old World. I studied construction techniques, estimated measurements, considered paint colors and thread choices. I analyzed weaving and knitting patterns, and dreamed of recreating them. 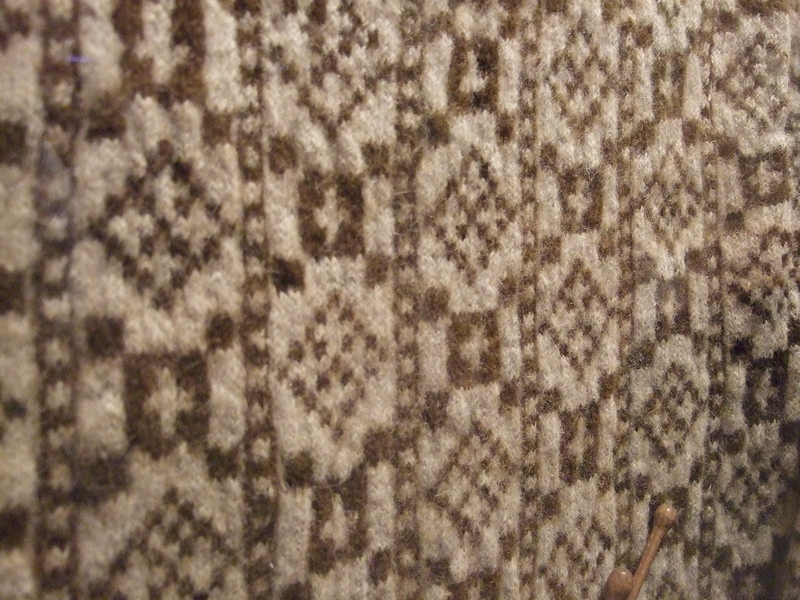 One of the knitted textiles in the Vesterheim collection. Years later, I visited Vesterheim again, this time with my husband Scott. We went to enjoy a new exhibit that focused on the contributions Norwegian-Americans made during the American Civil War. The programming and displays helped me consider broader stories. I imagined the questions and challenges that faced immigrants who had made the long and difficult journey to their Western home, only to have war erupt in their new country. On my recent trip to Vesterheim, I entered the museum with one goal: look at the ale bowls on display. It was, of course, impossible to ignore the rest of the exhibits! And this time, instead of thinking only about the objects, or even the Norwegian-American experience, I found myself asking the next logical questions. How did what I was seeing compare to what my own (non-Norwegian) ancestors experienced? One of the exquisite carved pieces in Vesterheim's collection. Vesterheim is a treasure that needs to be experienced more than once. Over the course of my own visits, I processed what I was seeing and hearing on different levels, in different ways. 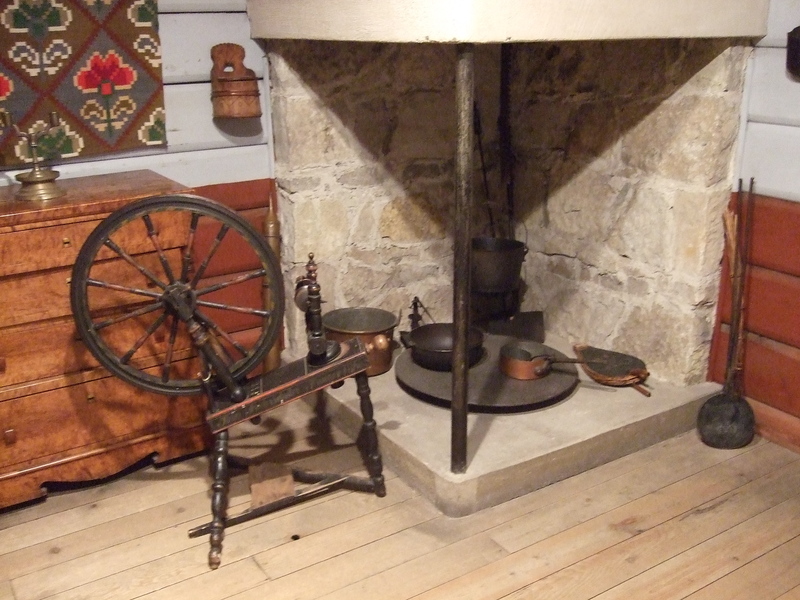 The artifacts and exhibits are important as examples of folk art. They are important because of the stories they tell—or at least suggest—about the people who originally made, owned, used, and ultimately preserved them. And they are important because they help all of us connect with our own heritage. Vesterheim uses the story of Norwegian immigrants to explore aspects of identity and culture common to everyone. Norwegian-Americans are lucky that thoughtful individuals did collect and preserve such an abundance of folk art. But those of us who descend from cultural groups which did not, perhaps, manage to save so much can be inspired to wonder about and search for our own ethnic and folk art traditions. In my case, how did my Swiss and Dutch and Scottish forebears express themselves with paint brushes, or knitting needles, or carving knives? Some of our ancestors carried what they could of their lives from old world to new in rosemaled trunks. Others tucked what was precious in battered suitcases, lumpy bedrolls, leather pouches…and, simply, their hearts. Vesterheim, and other historic sites and museums, remind us of that. Their collections hold treasures for us all. To learn more about Vesterheim, its collections, its educational programs and special events, and its ongoing classes in folk art and culture, visit http://vesterheim.org/index.php. And soon, I promise—on to the ale bowls!